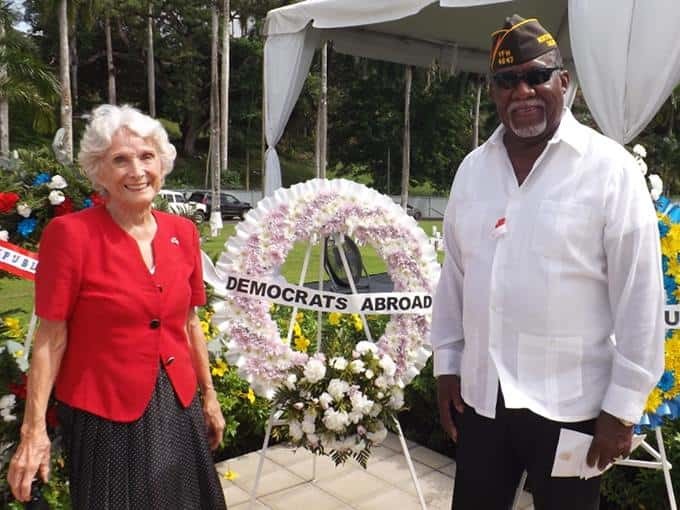 Leaders and members of DA Panama were at Corozal American Military Cemetery on Memorial Day to help honor the men and women of the US Armed Services who gave their lives in defense of our country. Presenting a wreath on behalf of DA Panama were Ramona Rhoades and Boston Patterson. Eric Jackson, DA Panama Chair, and member Rita Sosa were also in attendance. Those buried at Corozal include veterans from every branch of our military, from the Mexican – American War, the Civil War, World War I, World War II, and all other major conflicts. More than 5,000 people buried at Corazal include veterans and family members, as well as numerous brave service members who died in combat in the 20thcentury. Reminders - Your Participation is Important! 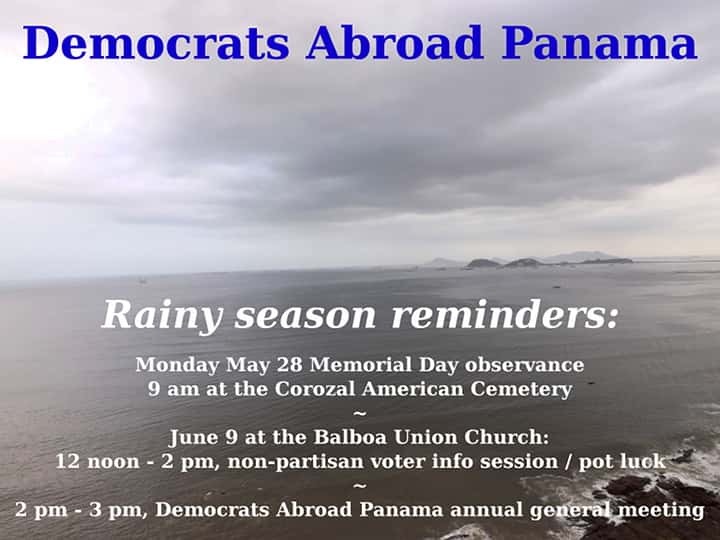 Democrats Abroad Panama will hold our Annual General Meeting of all active Democrats in Panama on Saturday, June 9 from 12 noon to 3 pm at Balboa Union Church in Panama City. In a year with critically important mid-term elections that will help Democrats take back Congress, we hope all Democrats in Panama will attend in person or online. By our bylaws, the Chair can fill vacancies with the exception of the position of Vice Chair, which was held by Ligia. Our rules do not allow Chairs to choose their successors or potential successors. In addition, the Democratic Party’s gender balance rules require the position of Vice Chair to be filled by a woman if the Chair is a man (or vice versa). Kim Antonsen has agreed to fill the vacancy left by Don’s departure from Panama. That leaves one vacancy on the board to be filled by an appointment, and the Vice-Chair role to be filled by election. Nominations are open now, and will be taken from the floor on June 9. Any member can run, or nominate herself or someone else to the position of Vice-Chair. For anyone unable to attend in person, there will be online voting and nominations accepted in advance and during the meeting by way of our email at panamademocratsvote@gmail.com. We will be webcasting on either Facebook or via WebX. Look for further notice about the details of this on our Facebook pages at http://www.facebook.com/Democrats-Abroad-Panama-party-212338612207789/notifications/ or http://www.facebook.com/groups/311349865599942/ or look for further emails or ask via our email address as above or call the Chair, Eric Jackson, at 6632-6343. We will have a speaker from the US Embassy about how to vote from abroad. This year we will be able to mail ballots and ballot applications from the embassy/consulate diplomatic pouch instead of depending on the often unreliable Panamanian postal service. Some lucky few of us will vote in states where you can cast a ballot electronically. Many more vote in states where you can order and receive your ballots online but must send the physical ballot to the U.S.
We are also working on getting a speaker from among the candidates who will flip Congress from Republican to Democrat this year, perhaps by an online connection. The meeting will start with a chance to mix and mingle over a potluck lunch. Please bring something to eat or drink and enough to share. • Memorial Day observance at the Corozal American Cemetery, Monday May 28 at 9 a.m.
• Panama Pride / Orgullo Panamá parade on Saturday, June 30 in Panamá City. Local LGBT organizations will be putting on a week of activities leading up to this. We will have more details on our Facebook pages and by email as the date approaches. Go to http://www.votefromabroad.org to register and order your ballot. You must request a ballot every year, early enough to be sure you receive it in time to have your vote counted! BIENVENIDOS A DEMOCRATS ABROAD PANAMA! DA-Panama is the official country committee for US Democrats living in Panama. Watch this space for upcoming announcements of meetings and events planned throughout the year, and encourage anyone interested in participating to get in touch. We have board members throughout the interior as well so please feel free to suggest meetings or activities in various interior provinces! If you have questions or would like to help with Democrats Abroad Panama please contact us.